Papaya enzymes are the enzymes found inside of the papaya fruit. These enzymes have some very interesting benefits, especially when used in the right way. Natural papaya enzymes can help improve your skin and even treat digestive tract disorders. But what exactly are enzymes? Enzymes are proteins that are required in every single cell in your body. These enzymes break down cellular products, refresh cellular contents, and help your body absorb nutrients. And they do different things based on where they are found. Enzymes in your stomach and gut help you break down the food that you consume so that you can properly absorb nutrients. This is important because not everyone can break down their food as easily as others! Those people who have indigestion or heartburn may be able to find relief by taking extra papaya enzymes. But what about on your skin? Enzymes help break down proteins when they are directly placed on your skin. And, because papaya is a fruit, it also contains powerful anti-oxidants that can be absorbed. The net effect is that these enzymes help break down dead skin cells, help refresh your skin, directly provide nutrients to the skin, and help hydrate your skin in the process. Let's talk about the different ways you can use these enzymes and how they can seriously impact your skin and body! There are two basic ways that you can get papaya into your body to impact both your cells and your digestive tract. The fruit is to consume the papaya directly and the other is to place it topically on your skin. Before we get into the specifics, it's important for you to understand that depending on how you use it will determine how effective it is for your body. If you want to use the papaya enzymes to help impact your skin then you must place it topically (directly on your skin)! While eating healthy is obviously great for your skin, it's simply not going to cut it by eating papaya fruit. 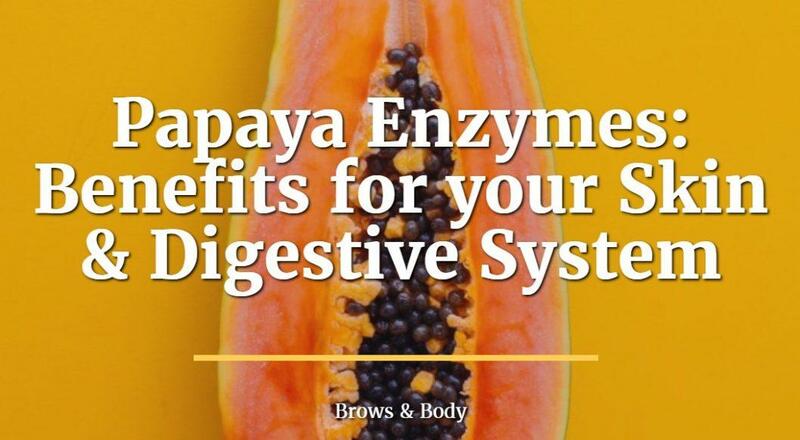 Before the papaya enzymes actually make it to your skin they are going to be broken down in your gastrointestinal tract and used to absorb nutrients before they are absorbed and transferred into your body. By the time it gets to your skin there is very little left. So, just make sure you understand that if you want to use papaya for your skin then you must place it topically on your skin. I'm going to give you some natural therapies that you can use to get it there below (which you can skip to if you want) as well. If you decide to use papaya for your digestive tract then you have a couple of options. The first is to consume papaya the fruit directly and the other is to take supplements which contain papaya enzymes such as papain. Either option may work well, it just depends on your preference for natural therapies and how you like to get it into your body. If you don't like the taste of papaya then you can still get the benefits of its enzymes by taking pills. Each fruit enzyme has a different benefit and effect on your skin. Some are more potent than others, some are better for acne than others, some are better for dry skin, and so on. It's up to you to match the fruit enzyme you want to use to your skin and your personal issues! You can do this yourself with a little bit of knowledge or you can find someone to help guide you. So, how does papaya enzyme fit into the equation? Papaya enzyme happens to be great for sensitive skin, for skin that is red or irritated and for those suffering from inflammatory conditions such as rosacea. It's not like papaya enzyme is the only fruit enzyme to help these conditions but it's much more likely that you'll have success with it if you use it for those conditions. Papaya enzyme can also be safely used on normal skin if your goal is to exfoliate, to slow down the production of sebum (oil), and to provide valuable natural fruit-based anti-oxidants directly to the superficial layer of your skin. Another benefit to using papaya enzyme on your skin is that it can calm down inflammation and reduce irritation or redness. This is particularly helpful if you suffer from inflammatory conditions such as acne, post-acne hyperpigmentation, rosacea, contact dermatitis and so on. Papaya contains powerful enzymes that help soothe down the skin by providing anti-oxidants to neutralize free radicals. Papaya also has tremendous benefit as an enzyme which can impact your digestive tract in a positive way. Papaya contains a load of different enzymes but the most well-known include Papain and Caricain. Both enzymes serve different functions depending on how and where they are used. Papain is often used to tenderize meats because it helps break down protein bonds. Caricain, on the other hand, helps break down gluten proteins (up to 80%!) and can be used in people who have gluten sensitivities (but probably not Celiac disease). Enzymes also play an important role in regulating the type and amount of bacteria in your gut. We know, for instance, that certain skin diseases can be triggered or caused by imbalances in gut bacteria concentration. Using enzymes may therefore also help regulate your gut bacteria! If you want to use papaya to help in digestion then I recommend a supplement such as this. The ideal way to use it is either right before you eat or directly after. That way it can help you break down the food that you just ate! Please note that taking a supplement by mouth will not help your skin, though! We know that you can use papaya directly on your skin, but how do you actually go about doing that? Should you use papaya enzymes directly in facial products? Should you use a concentrated papaya enzyme blend for a prolonged period of time? It turns out that probably the best way to use papaya for your skin is in the form of a peel. Peels are therapies which involve leaving certain products directly on the face for a set period of time. They are often extremely helpful because they contain concentrated amounts of enzymes or proteins which help break down dead skin cells, refine the skin, and reduce inflammation. Using papaya in a peel is probably the single best way to use it directly for your skin. The 'natural' way by crushing up papaya directly and then applying it to your face. Or by purchasing a concentrated papaya enzyme peel and then placing that directly on your skin. Papaya is predominately helpful for those suffering from acne, redness, blotchy skin, normal skin and it's very effective at removing dead skin cells and reducing oil production in the skin. Did you know that you can actually just take fresh papaya, crush it up, and apply it to your face? If you prefer to do things the natural way then you might find this homemade enzyme peel ideal. The only downside to using a homemade peel is that it may not be as effective as cosmetic grade peels. If you don't want to try the homemade papaya enzyme peel then you always have the option of ramping up the effects by using a cosmetic grade peel. Cosmetic grade peels are often much more powerful than natural plant-based peels because they are more heavily concentrated with enzymes. A cosmetic grade peel can have the power of 50+ entire papaya's because all of the concentrated enzymes can be placed directly into the cream! You simply can't get this kind of concentration and power when using fruit. This doesn't mean that you absolutely have to use a cosmetic grade peel, but it is important to understand the difference. There may be situations in which you want to get the benefits of papaya enzymes but you may not see them while using a fruit-based peel. You can get a papaya chemical peel from most estheticians. Cosmetic papaya peels often come combined with other fruits. The peel that I often recommend comes complexed with coconut or pineapple and contains no chemical ingredients! Just the pure natural fruit enzymes. Using peels is quite easy once you have the product. All you need to do is wash your face, tone your skin, and then directly place the peel on your skin. You then let it sit for a selected period of time. Sometimes this can be as short as 10 minutes and in some cases, it can be left on overnight (it just depends on the concentration of the enzymes and peel). When using papaya enzymes (cosmetic grade or homemade peels) it's important to have the right expectations. Using enzymes is not an immediate results kind of therapy (compare that to something like microneedling which is). You will most likely need to use the peel at least 2-3 times each week in order to get the benefits you are looking for. You should start to notice some improvement by week 3 (if using 2-3 times per week) and your results should persist after that. By week 3 you should start to see a brightening of the skin, your skin tone should be more even, and you should notice a reduction in oil production on the skin. If you are trying to treat more advanced conditions such as wrinkles or age spots, then you might have to look to more powerful therapies such as retinol, vitamin C serum or niacinamide. Papaya is a fruit which contains several important enzymes. These enzymes can naturally improve both your skin and your digestive tract depending on how they are used. My favorite way to use papaya is directly on the skin, either by crushing up natural fruit or by concentrating it into a peel. Using it on your skin can help reduce irritation, reduce hyperpigmentation, and may be helpful for those with irritated or red skin. Taking it by mouth, on the other hand, can help break down your food and reduce indigestion. Did you know about all of these benefits of papaya? Do you plan on giving it a try for your skin? What about your GI tract?